While waiting to catch that shot, he also took this photo of the moon. 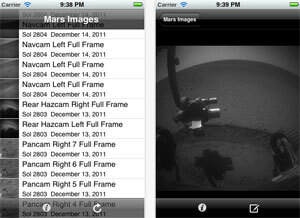 Mark Powell of NASA’s Jet Propulsion Laboratory has created an iPhone/iPad app lets you browse through the most recent images from the Mars Rover Opportunity. You can download Mars Images from the Apple App Store for free (also available for Android). I’ve been checking for new images daily for eight years now – this is going to save a LOT of time! Jack began his presentation by doing his impression of the airbag-encased rover bouncing on the surface of mars, then driving off his landing platform. He then explained to his classmates all about driving around, taking pictures and looking at rocks – illustrating each point with his model. During the question and answer period, he expertly fielded each one, including a question from a parent who was helping out in class that day. Finally, one of the kids asked how the rovers get back from Mars. Flashing his best “you moron” look, Jack answered “that would mean sending another rocket to Mars to go get them, and it takes a long time to get there, and it’s really cold, and nobody would want to go except me and Craig!”. Jack and I have been discussing our trip for some time – I sure hope we get the chance. Scott Adams declares his candidacy for President of the United States. Today is Carl Sagan Day. Of all of his books, my favorite has to be The Demon-Haunted World: Science as a Candle in the Dark, followed closely by Contact. Honda ann0unced an all-new ASIMO robot – faster, lighter, and able to operate more autonomously than previous models (yet managing to preserve the same fascinating/creepy feel). “It all started with a single sketch. It was a picture I drew during a brainstorming session on vehicles of the future. I wondered if it would be possible to create a vehicle with a form like this that could move freely in all directions—sort of like a witch’s broom or a magic wand. I thought it would make an interesting project,” he laughs. I don’t think there’s any other device that actually makes riding a Segway look cool. The U3-X website has some interesting images and videos – I especially like the one of researches in lab coats having a meeting while riding their U3-X’s, and the women riding them through a museum exhibit. I do think a device like that has its place, but some of the examples Honda shows are pretty hilarious. 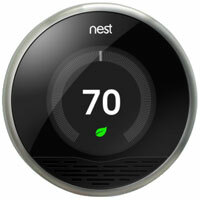 I ordered my Nest Learning Thermostat on the day it was announced, and then started receiving email status updates with dates creeping into 2012, so I was especially happy to get an update today with a more definitive shipping date of 3 weeks from now. Can’t wait to start playing with this new toy! 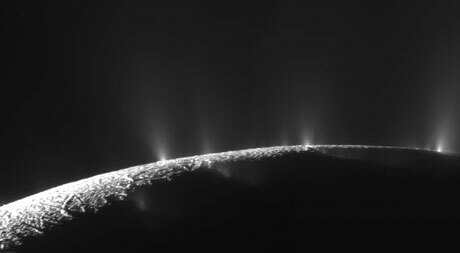 Another of my favorite space images – water plumes jetting into space from the south polar region of Saturn’s moon Enceladus. A recent comment from a reader about her 2-1/2 year old grandson’s reaction to watching a National Geographic show about the Mars Rovers and Mars Phoenix Lander (and his creative suggestion about how to save Spirit) reminded me that I’ve been meaning to write about my 4 year old friend Jack and his obsession with Mars. It seems to have started about 9 months ago during a long drive, where we filled the time by talking about space. He seemed especially enthralled with my description of Mars, and the rovers really captured his imagination. We had really poor reception, but managed to download a few images on my iPhone, and he studied them intently for the whole trip. I later heard from his mother that all he talked about after that trip was Mars, Mars, Mars… and he seemed to remember everything I had told him (of course, sufficiently altered by a 4 year old’s memory, but still amazingly accurate). Of course, I couldn’t pass up the opportunity (no pun intended) to mold a young geek’s mind, so I ordered him a copy of 5 Years on Mars, the National Geographic DVD on the first five years of Spirit and Opportunity’s mission. Little did I know that this would mean sitting with Jack to watch the DVD every time we were to together (and each time, he watches it with the same intense concentration, absorbing every detail for the 100th time). I have no doubt that he could pick Scott Maxwell or Steve Squyres out of a crowd! Against my better judgement, I order him a model rover, entirely inappropriate for 4 year old hands, but a wonderful way for him to visual the workings of the rovers. Of course, I also ordered one for myself, and his became Opportunity and mine was Spirit (he seemed to prefer that it was mine that was stuck, and his would come and rescue me). The model has actually held up pretty well, with most parts still intact, but one of the solar panel is definitely dipping downward (out of fairness to Jack, most of the damage was done when Mom dropped it). I can’t think of any other NASA mission capable of striking a nerve with your geeks the way story of Spirit and Opportunity has. Does anyone else have stories about kids and the Mars Rovers? I’d love to hear from you. Today is World Polio Day, which marks the birthday of Jonas Salk, the creator of the polio vaccine in 1955. Since that discovery, polio diagnoses around the world have decreased by 99%. The Gates Foundation has donated $355 million to finish the job, with a goal of raising an additional $200 million from people around the world. Support the push to reach 100%.